Most people who know J would admit he is definitely a little wacky in many ways. Maybe it's just typical two-year-old nature, but he's out there sometimes. I just wanted to share his latest proof of this. 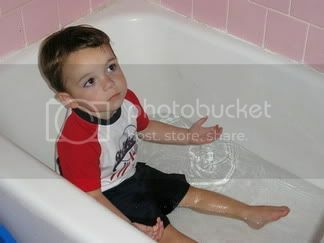 We all know he loves water, and the only way to get him out of the bathtub is to let all the water drain out. We didn't realize, though, that we should probably take his clothes off before we run his bath water. Big J ran some water for little J's bath the other night. He turned around for a minute, and this is what he found when he looked back at the tub. Just thought this would give most of you a laugh. It's so him. He just sat there trying to figure out why we were laughing. Then he got a little grumpy when we actually made him take his clothes off. Funny, funny boy. What a cute picture and a great story. I'd say you are right - he seems to love water! Look of "What's wrong mom?" " I am having fun now..."